A Dodge Dart packed with Mopar goodies will be displayed at the Chicago Auto Show, making it the fourth special-edition Mopar-badged vehicle since Fiat's takeover in 2009. This angry beast is going to be as rare as another product we can thanks Sergio Marchionne for, the Ferrari "F150," as only 500 numbered units will be built in Belvidere. That's where the differences stop. The 1.4-liter MultiAir engine puts out 170 hp and 180 lb-ft thanks to the intercooled turbocharging in normal tune, and since the free-flowing exhaust probably improved on that, Mopar made sure the rest of the car is up to handling the power. 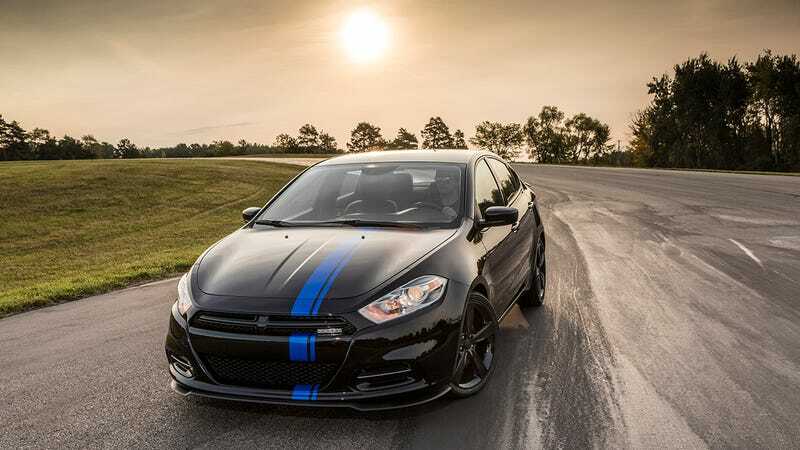 The special Dart comes with a six-speed manual and sits 0.27 inches closer to the ground, while the 18" rims have a gloss black paint job with 225/40 tyres wrapped around them. Those should work well with the revised steering and the slotted brake rotors. While it would probably stay on Earth without a ground-effects kit as well, Chrysler wanted to make sure, so it comes with spoilers all around and a diffuser at the rear. The just-as-black-as-the-rest crosshair grille has a badge in the corner shouting Mopar, while two Mopar Blue stripes complete the tuned looks. The interior gets a premium feel thanks to black on blue leather seats, some extra chrome and blue lighting. More importantly, it has wireless charging for smartphones, an 8.4-inch navigation screen, metal pedals, and leather-wrapped steering wheel and shifter knob. The serialized badge you were so keen on is also on the dash. The car comes with a custom-made black case, which contains a personalized plate with vehicle specifications, the date of manufacture and the unique identification number of the vehicle. Oh, and "a limited-edition sketch of the car signed by Mark Trostle, Chrysler Group Chief Designer for the Mopar Brand." Something for your garage wall.